P: Vehicle type (P indicates passenger vehicle). 215: Tire width in millimeters. 45: Aspect ratio (the tire’s section height as a percentage of its width). R: Tire construction code (R indicates radial). 17: Rim diameter in inches. 87: Load index (a numerical code associated with the maximum load the tire can carry). V: Speed symbol (an alphabetical code indicating the maximum speed rating). Cold Tire Pressure – The tire air pressure when the vehicle has been parked for at least three hours or driven less than 1 mile (1.6 km). Load Rating – Means the maximum load that a tire is rated to carry for a given inflation pressure. Maximum Inflation Pressure – The maximum tire air pressure that the tire can hold. 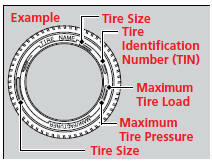 Maximum Load Rating – Means the load rating for a tire at the maximum permissible inflation pressure for that tire. Recommended Inflation Pressure – The cold tire inflation pressure recommended by the manufacturer. Treadwear Indicators (TWI) – Means the projections within the principal grooves designed to give a visual indication of the degrees of wear of the tread.